Fulfilling a lifelong dream of the software company founder, all AEB employees are now unified under one roof at the 155,000 square foot headquarters in Stuttgart. 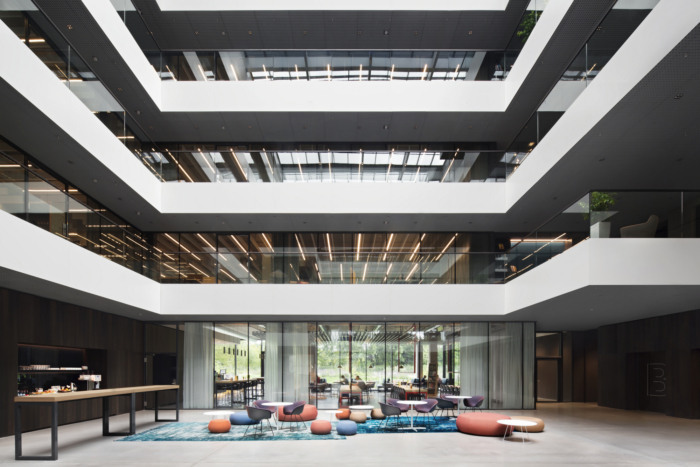 Ippolito Fleitz Group and Riehle+Assoziierte developed a unifying design for the headquarters of software company, AEB, located in Stuttgart, Germany. The new Stuttgart-Möhringen headquarters of AEB, a leading manufacturer of logistics and foreign trade software, fulfills a life dream of the company’s founder: to unite all employees in Stuttgart under one roof. Stuttgart-based architectural firm Riehle+Assoziierte has designed a new building that fulfills the desire for a transparent architecture. The office space with its 400 workstations is arranged around a four-storey-high atrium that allows for circumferential movement. We in turn have created a differentiated offering of work and communication worlds, effectively translating the company philosophy “offen.kundig.eigen.bestimmt.weiter.führend.gut” into a stimulating interior architecture. Informal communication zones can be found on every floor on the large and small balconies, which are located in diagonally opposing corners of the square atrium floorplan. On the large terraces that overhang the atrium, deep-pile carpets create lounges with diverse seating possibilities from throne-like armchairs and flexible sofa landscapes to moveable poufs. Adjacent kitchenettes transform these areas into communicative zones for informal meetings and brief discussions. Bold pendant luminaires set striking highlights on the large balconies and serve as a vertical connection between floors. On the smaller, recessed balconies, it is all about creating a front room ambience. Seating groups with wing chairs and a library with specialist literature create a quiet place where employees can work undisturbed. Every floor also has a themed room that can be used for larger meetings, as a place of retreat or for in-depth group work. Small cocktail chairs on a fluffy carpet, standing lamps and a cupboard transform the “Thinktank” into a living room. A large red elephant initially appears disruptive, but then allows ideas to take flight. On the fourth floor, the “Albflug” offers views that stretch as far as the Swabian Alb. Modern interpretations of traditional inn furniture like corner benches and rustic chairs create an earthy yet by no means conservative ambience. The “Bastelraum” or craft room does exactly what it says on the door: a large workbench and a wall of work materials invite employees to take part in creative meetings. The “Digital Lab” is the place for the technology-minded to test the latest technologies and conduct research with 3D printers and virtual reality. The new office building finally offers a home to all AEB employees in Stuttgart. The work worlds that have been created within bear testimony to a readiness to change, a boldness and an openness with which the company can look forward to the future.